Samsung Galaxy S5 has finally been launched at MWC Barcelona and mind you, Samsung fanboys are in for some disappointment!! Galaxy S5 features a 5.1 inch full HD 1080p super AMOLED screen,contrary to the rumored 2k QHD display.The QHD screen would have been an impractical choice as it would drain the battery faster and cause performance issues. Galaxy S5 is powered by a snapdragon 800 chipset clocked at 2.5 GHz and features Adreno 330 GPU. No word on the exynos(octa core) version yet. The camera has been upgraded significantly ,the rear shooter is a 16MP unit with selective focus and and supports 4K video recording. Surprise!!surprise!! Galaxy S5 features a fingerprint scanner in the home button.You need to swipe your finger 8 times to record it and after that you will be able to unlock the S5 with your fingerprint. You can also authorize PayPal payments with just a single swipe of your registered finger. On a positive note,the standard version of galaxy s5 is waterproof and dustproof with IP67 certification ,this means no separate "active" version of the phone. 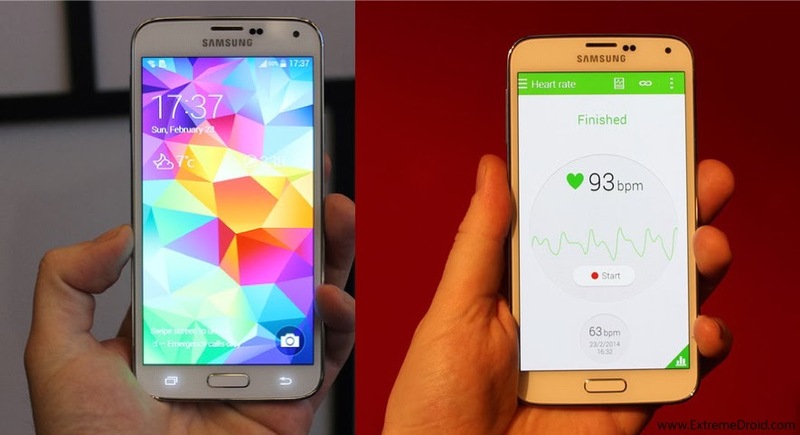 Galaxy s5 features Heart rate monitor,humidity and temperature sensors apart from the usual set of sensors. Galaxy S5 runs on android 4.4 KitKat,with a new version of TouchWiz UI with flat and round icons.Galaxy S5 supports "OK, Google" command to launch Google Now anywhere,just like the Moto X.
Galaxy S5 features 2GB RAM,16/32 GB internal storage and an SD card slot. 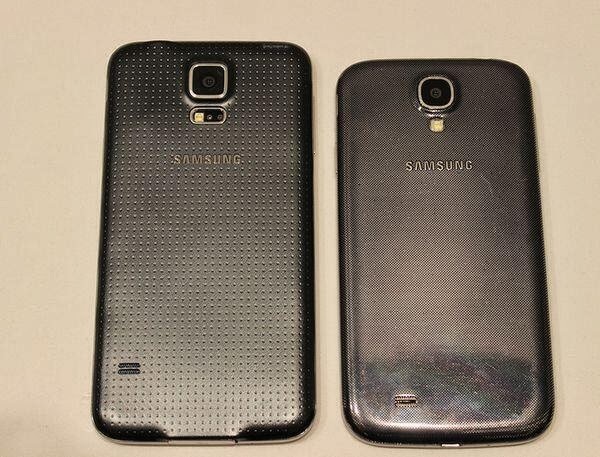 Most disappointing part of Galaxy S5 is the design,The front looks similar to that of Galaxy S4,back of the device features a matte plastic with dotted texture.Galaxy S5 will be available in Gold, black,blue and white colors. Galaxy S5 features microUSB 3.0 ports ,MHL ,LTE connectivity with download booster mode where you can use both Wi-Fi and LTE for super-fast downloads.WiFi a/b/g/n ,NFC and bluetooth 4.0 is also supported.Battery capacity is of 2800 mAH. Galaxy S5 will be available in early APRIL along with the new galaxy gear series,stay tuned for more updates.